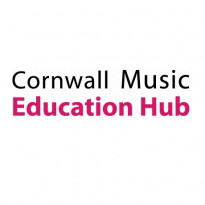 The Cornwall Music Education Hub’s county orchestras, the Cornwall Youth Orchestra and the Cornwall Youth Wind Orchestra, both held their Easter concerts in Truro Cathedral, the culmination of the year’s hard work and following their Easter residential courses. 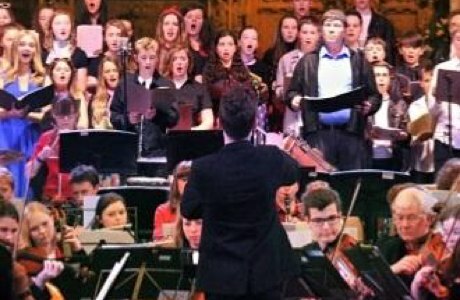 The Cornwall Youth Orchestra held its annual public concert on Friday 8th April. 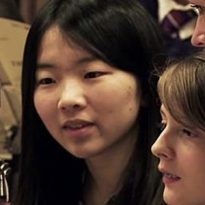 The 80 strong Orchestra, made up of players aged 10–19, was conducted by16 year old Angus Webster who has been conducting the Youth Orchestra, under the direction of Tim Boulton, for the last 18 months. The concert programme included a selection of works from the BBC’s Ten Pieces project. 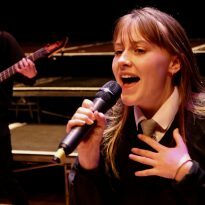 For the pieces from Carmen and West Side Story, the Orchestra was joined by the Ten Pieces Choir, led by Angela Renshaw, the Hub’s Vocal Strategy Lead. 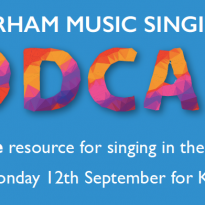 This choir was made up of 75 singers from the Cornwall County Choirs as well as students from Budehaven, Helston, Launceston, Richard Lander and Torpoint Secondary Schools. 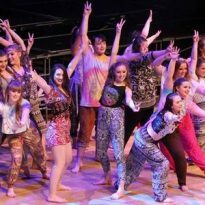 The solo parts of Carmen were performed by Rebekkah Scamp (Truro College) and special guest vocalist from the BBC Singers, Matthew Minter. The Cornwall Youth Wind Orchestra, conducted and directed by Janet Elston, invited a host of guests to join a special Easter concert to mark its 30th Anniversary. These guests included former members of the Orchestra who had returned to Cornwall from across the country especially to join the celebration. In the second half of the show, the Orchestra was joined by the Cornwall Boys’ Choir, Cornwall Girls’ Choir, the Hall For Cornwall’s Youth Theatre and Hall For Cornwall’s Youth Dance Company to perform the British premiere of the fairy tale inspired musical drama, ‘Once Upon a Time…’, written by Jan Van Der Roost and translated into English for the first time. All five groups came together to perform an hour long ‘dramatic re-enactment of Grimm’s fairy tales: Little Red Riding Hood, Sleeping Beauty and Rumpelstiltskin.